Magnificent main level living with bells and whistles at every turn is what youell find when you see this weekes Showcase Home. 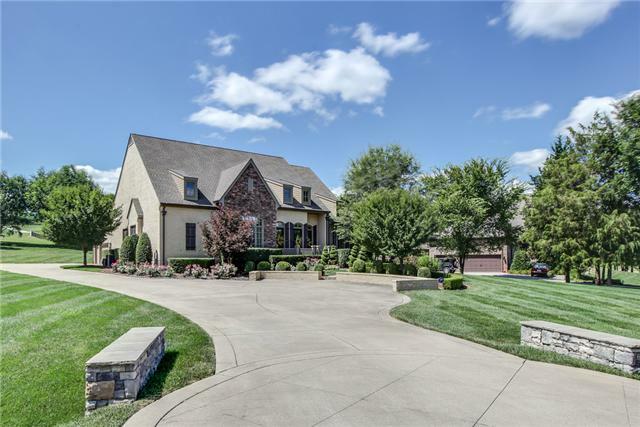 Located at 2442 Durham Manor Drive in Franklin, this beautiful property, located on just over one acre, is dotted with mature trees and surrounded by meticulous landscaping. It has all the special features youeve been searching for and ites one and one-half levels so you can finally leave the incessant stair climbing behind. Curb appeal doesnet get any better than this. An impressive long driveway frames the impeccably manicured lawn leading to the front door of 2442 Durham Manor Drive. Youell immediately notice how the use of stacked stone and stained wood doors on the front of this four bedroom, four full, and two half-bath beauty adds interest and depth, along with character. Youell be just as pleased when you see whates waiting on the inside of this 4,244 square foot charmer, listed at $829,900, and featuring an extra-long three car garage. Wonet dad be happy! The bright, open floor plan of 2442 Durham Manor is evident as soon as you take your first steps into the beautiful foyer, with 10-foot ceilings and rich hardwood flooring that extends throughout the first level. The dining room to the left features an airy 10-foot ceiling, wonderfully unique dual hardwood doors leading to the front porch, along with a stunning coffered ceiling, custom chandelier and transoms framing the top of the oversized entryways. What an impressive place to entertain. Adjacent to the dining room through beautiful French doors is a roomy office featuring built-in shelving and cabinets for all your books and storage needs, a trey ceiling, another custom chandelier which adds warmth and charm, and lots of natural light. Just ahead is the large, open concept family room. Ites anchored by a chic stacked stone fireplace with gas logs flanked by shelves and cabinets, along with recessed lighting and two easy, breezy ceiling fans above. You wonet believe the stunning eat-in kitchen attached to the family room. It includes custom cabinets, granite countertops and a painted center island with a beautiful chandelier above; stainless steel gourmet appliances including a double oven, warming drawer, six burner Viking range, sophisticated tumble marble backsplash with custom inlay not to mention lots of room for prep work and a pantry. Perfection! Just off the family room is the spacious master bedroom, which features a bay window overlooking the back yard, coffered ceiling and French doors leading to the screened porch. The en suite master bath is just as warm and inviting, with travertine floors, custom separate vanities, sconce accent lighting, a large stone shower, Whirlpool soaking tub and huge walk-in closet with hardwood floors. What a great spot to begin and end each day! The massive bonus room at 2442 Durham Manor Drive is just up a short flight of stairs, conveniently located off the kitchen. It features black out curtains for watching movies, built-in shelving and includes a wet bar and bathroom. Nothing says erelax and unwinde quite like a screened-in porch. This one has a beadboard ceiling, ceiling fans, recessed lighting and peeks out over the private oversized patio and expansive backyard which is large enough for a pool. The home at 2442 Durham Manor Drive is main level living at its finest. This property is zoned for Oak View Elementary, Page Middle and Page High. Contact Dee Russell with RealtyTrust Residential today, (615) 207-4585, or email Dee@DeeRussell.com.